A golf simulator allows golf to be played on a graphically or photographically simulated driving range or golf course, usually in an indoor setting. It is a technical system used by some golfers to continue their sport regardless of weather and time of day in a converted premises. The convenience of playing golf anytime, anywhere, regardless of weather! Golf simulators continue have really improved over the past few years and more accurate and more affordable. Because not everyone’s needs are the same, that includes budget as well, there are several golf simulator packages to choose from. Check out the best golf simulator packages below. This residential golf simulator package starts with the 2018 best value golf simulator (as voted by Golf Digest), the SkyTrak Launch Monitor. The Platinum Package also includes The Net Return Simulator Series and Projector Mount Kit, keeping your golf setup completely self-contained (meaning no need to drill any holes in your walls). On top of this, you get a great value mat in The Net Return Pro Turf Golf Mat that provides the perfect balance of durability and forgiveness. With the realism, accuracy, and fun gameplay options of the SkyTrak combined with the ease of setup, you cannot go wrong with the SkyTrak Platinum. The best cheap golf simulator package is The Golf In A Box. It comes with the OptiShot 2 simulator, a popup net, and a mat that fits perfectly with the OptiShot unit. If you have the extra space in the garage, check out this one. 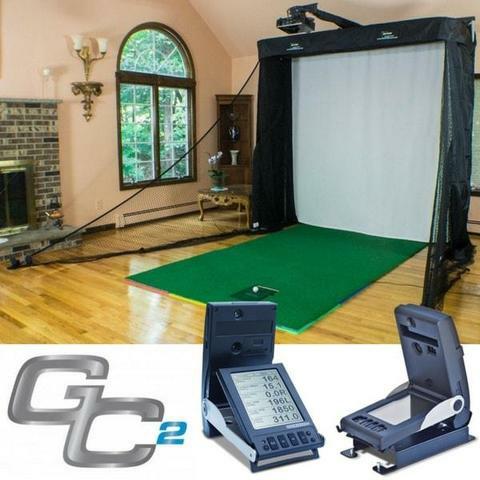 The HomeCourse has a retractable golf screen that comes with a ceiling mount kit allowing you to mount your golf simulator screen to the ceiling of your garage. When you are not using your golf simulator, you can simply retract your HomeCourse golf simulator screen with the push of a button. All you’d have to do is move your golf mat out of the way and you can even continue to park your car in the garage. The convenience of being able to store your golf simulator away when not in use makes this one perfect for the garage. Ease of setup and lightweight design is the absolute key for creating your outdoor golf simulator setup. This package is the ideal way to create a portable golf simulator, with ease! The Net Return is hands down the best golf net on the planet plus it comes with a 250K shot guarantee. Also, you can set it up and take it down within minutes. At a 28 pound total weight, you can easily move this setup inside or outside. For those really looking to take their game to the next level, the GC2 is trusted by PGA golf professionals and coaches as the top launch monitor on the market today. The GC2 features state-of-the-art image processing that captures thousands of snapshot pictures of the ball immediately after impact to give you an extremely accurate reading of your shot. With the recommended HMT add-on, you get a full analysis of swing and club head performance data including club head speed, smash factor, horizontal club path, and more. As you step up into the commercial grade golf simulator category, there are a few top recommendations. For high revenue pro shops, golf simulator bars, and elite country clubs, check out the widelu popular E6 Golf Software, TruGolf Vista 8 Series. Features next level TruTrack swing analysis software, high-definition image quality, and a light-weight portable design.